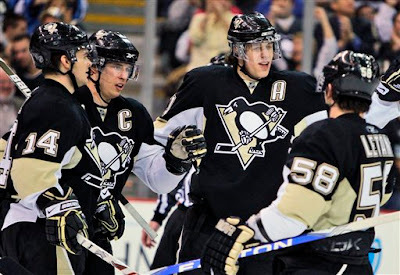 Hockey Plumber: What Is Wrong With the Penguins Power Play? The Pittsburgh Penguins are the defending champions. They are tied for the league lead with 20 wins and are fourth in the NHL in goals per game. They have two of the best players on the planet. Yet, the Penguins' power play ranks twenty-eighth in the league, converting on a pathetic 14.0% rate. Contrast that with the league leading Capitals at 24.4% and one can really see how poorly the Penguins fare. Let's go back to the 2007-08 season when the team was on their way to the first of two consecutive Stanley Cup Final runs. Pittsburgh finished that regular season fourth overall with a 20.4% power play conversion. Last year they dropped to twentieth at 17.2% and now have fallen even further down the chart. Why? There are two main differences between the power play units of '07-'08 and today. 1. No Petr Sykora. 2. No Ryan Malone. Although he struggle in other facets of the game, particularly once Dan Bylsma's system was implemented, Sykora was effective with the man advantage because he had a knack for finding shooting lanes and actually shot the puck. Consider two seasons ago when Sykora was second on the team in both shots and power play goals; and then second again in power play goals, third in shots last season. Malone two seasons ago had 11 power play goals which ranked him third on the team. With Tampa last season he was third on the team and ranks second on the Lightning this season. Malone provided the Penguins with the all important in-the-crease presence that the team has not been able to replace. He was the type of body that could absorb nightly punishment in front of the net and he had the hands to finish in tight quarters. Like Tomas Holmstrom... five years ago. With the man advantage, Penguins are often accused of trying to be "too fancy" or looking to make "the perfect play," but without a gunner and a crease cleaner, are they not forced to attempt to dissect their opponents penalty kill? Maybe it is too early yet to judge their special teams performance just one-third of the way into the season, considering the injury issues they have faced. However, if they never find a replacement for the elements that Sykora and Malone provided, they will continue to struggle.